The internet has discovered yet another Halo 3 PC reference buried within AMD's beta drivers. Back in early February, some Steam users started poking around and found references to a Halo Trilogy release within Steam's database. Before anyone could get too excited, Microsoft officially denied the whole thing, stating that there were no plans to launch any Halo PC ports on Steam's digital platform. Now the question of Halo ports has cropped up yet again after the discovery of Halo 3 references buried within AMD Catalyst's beta driver. Microsoft is once again assuring audiences that there are no plans to re-release the popular games, despite the fact that we're now one incident away from making coincidence into a likely reality. The Halo 3 reference was found in the application profiles of AMD's Catalyst 13.3 beta, listing support for the console-exclusive title. Admittedly, a tiny piece of code doesn't mean anything, and could simply have acted as a sample placeholder. That certainly is the position Microsoft took when asked about Halo 3 by Eurogamer. "We currently do not have plans to release any Halo titles on Steam," a Microsoft spokesman said, "nor do we currently have plans to release a PC version of Halo 3." While anything we say about Halo's PC future is speculation, it certainly wouldn't be the first time re-release hints were discovered, denied by publishers, and then confirmed anyway. 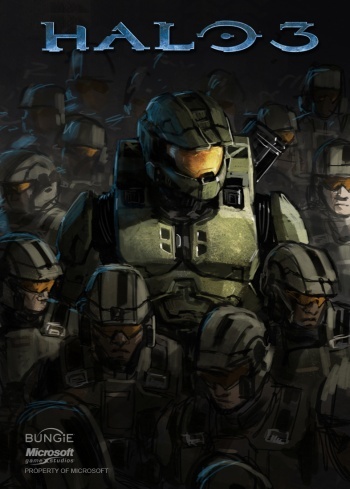 Either way, if Microsoft isn't planning a Halo 3 port, it seems like a missed opportunity. As far as PC gamers know, Halo 2's story ended in a cliffhanger before Master Chief could prevent a galactic catastrophe. Given that fan reactions of the original "rumor" were largely positive, I imagine a fair number of PC gamers would love to see what happens next. While we're on the subject, it's worth mentioning that Duke Nukem 3D was also listed on Steam's database, and was confirmed for re-release a week later.